The possible internal device is shown in Fig,2 (the device is turned upside-down with respect to the photos). Since the author of this work does not purpose to appropriate other's fame, then there is an attempt to explain easily the arrangement of the engine. Besides, in spite of the fact that in Internet there is rather extensive information on the device, however its immediate operation is not properly explained. There is an opinion that the device is a mystification and cannot work at all. But I think this is not the case. 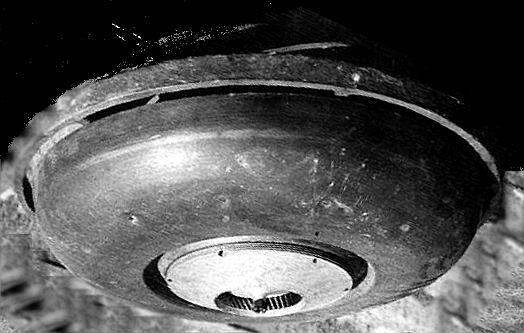 Undoubtedly a wheel, which seems strange at first sight (see Fig.3), is the main part of the engine. The engine consists of 24 corkscrews-like devices, which rotate in circle (see http://evg-ars.narod, on the origin of tornados). Schauberger created the ideal conditions for appearance of the group of mini-tornados and the central tornado, which is the motive force of the device. At the first stage by means of the wheel, air swirls around the axis of the electric motor. 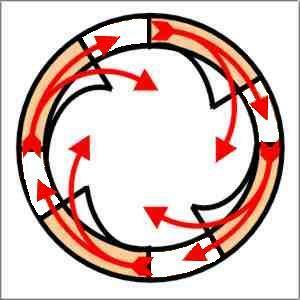 Due to centrifugal force the same air is thrown to the periphery, passes through "corkscrews" of the wheel and obtains rotation down axis of each "corkscrew". Air simultaneously swirls around 2 axes of rotation. Let's try to take a high-speed electric motor with a flywheel, which is fixed on the axis. Then rotate the device around your hand. At the turning of the motor you will feel the forces, which acted in the way you do not expect. Thus the wheel creates 24 mini-tornados. The upper part of the device looks like a copper basin (see Fig.4). Turning round the internal surface of the upper part of the device, mini-tornados move away to the internal cone of the device and forward the outlet. 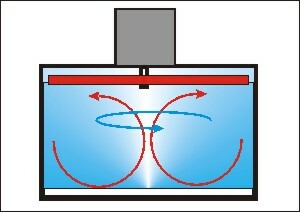 The cross section of the device allows understanding of the essence of tornado, which is observed from the vertical view. The first section, which is placed a little lower than the "copper basin", is the cross-section of the tornado. The rest of two sections are placed closer to the outlet (only 9 balls are represented in Fig.6 but the principle of operation is the same). Schauberger asserts that the process becomes to be self-sustaining. Natural tornado can exist for a long period of time and, obviously, the very existence of it is sustained only by pressure difference between environment and the internal cone of the tornado. The discharge zone is created in the very center of the device. It means that ambient air must approach there, after coming on the turbine blade and entraining in the rotation with complicated trajectory (such a rotation can be called a "self-eversible toroid"). It seems to me that these are the basic principles of operation of the device. Indeed, such a process can be concerned as an opposition to the ordinary explosion, since the matter does not move from the center but on the contrary, tends to constrict into the common point (to the top of the vortex). Schauberger called this process as implosion. The rotating mini-vortices, which composite a tornado, are attracted to each other and tend to move to the basic center of rotation. Let us return to Schauberger. The witnesses of operation of Schauberger's device asserted that only air and water were used as a fuel. Possibly, they were wrong a little. Most likely there were air and spirit, which looks like water. During the operation the engine must consume ambient air and if to provide it with some fuel and burn it, then it will forward the process of the vortex creation. In the presence of the big amount of oxygen, the flame of spirit is almost invisible. As a result, there is a "flameless and smoke-free engine", as it was presented in some publications. In my conclusions I came to approximately the same design. Thus I offer a device, which remotely resembles Shauberger's "windmill". In general, operation of the device is based on the same principles. The similar laws are valid for the whirlpool in a bath and for the devices given below. As distinct from Schauberger's device, there is no main cone, along which the vortex constricts to the center and is ejected through the nozzle. Another distinction consists in more simple design of the wheel, which is used for creation of the vortex (actually it is a usual centrifugal pump). The simplification of Schauberger's design (Fig. 7) is caused by the fact that a natural tornado does not need similar contrivances (though his "corkscrew" wheel calls nothing but admiration, since by the simplest and effective way it swirls air blasts at 2 perpendicular axes of rotation!). My aim is to swirl the air blast into a small tornado as simply as possible and it is desirable to use no mechanical components. This can be achieved, if instead of turbine of centrifugal pump, we will use something like MHD-engine (magnetohydrodynamic engine) for swirling (see http://evg-ars.narod.ru). There is a design, which has no moving components (except for the vortex). In the lower part of the device (Fig. 8) there is a burning fuel (possibly, kerosene?). Moreover for MHD-engine we should use electro-conductive kerosene (possibly, salted) and natrium addition agent. Roughly speaking, there is an attempt to reproduce the natural phenomenon in a can. The essence of the process can be understood from Fig.9. Fig.9 "Tornado in a glass" Fig10. "Natural tornado"
The process, represented in Fig. 9 , was firstly noticed by Einstein in an ordinary glass with tea and floating tea-leaves (let us call it Einstein's glass). Examine closely the central upward part, which is namely a "trunk of tornado". It seems strange that Einstein did not made the same conclusions. Vortex can be easily created at rotation of fluid or gas and if the conditions of rotation at top and bottom of the device are unequal, it is nearly a ready self-sustaining system. Not much of energy is necessary to make the process continuous. And what is more, the vortex absorbs energy from environment in the form of heat! Let us examine the simplified diagram of Schauberger's engine ( Fig.A ). The design can be presented as the following simple diagram, which is nothing but the development of the idea of Einstein's glass. At the top of the internal part of the device there is a rotating disk (it is in red color). There is an upright plate below. This design allows the unequal conditions of rotation for lower and upper sheets of water (air?). On the left there is a heat-exchanger (it will be described below). On top there is a motor-generator, which at first serves as a starter of the process, and after it reaches the tornado mode of operation it serves as energy generator. A valve, which is fixed on the heat-exchanger,serves as a breaker of the process. The arrow in the left is an actuating fluid of the device. This actuating fluid is heated by environment. Centrifugal forces cause the increase of pressure at walls of the vessel and rarefaction in the central part. Due to the high angular speed of rotation of upper water (air) sheets, as compared to the lower sheets, a meridional stream is created. This stream goes down 'along walls of the vessel and goes up in the central part (in nature it is nothing but "trunk of tornado"). Moving along its complicated trajectory, fluid (gas), falls sometimes into compression space, sometimes into vacuum space. Let us remember the fundamental physical law, vizBoyle's law If we take a definite gas mass, then gas will be heated at forced compression and cooled at rarefication. Thus, in the central part of the device air-and-water compound comes to vacuum space, which is caused by centrifugal forces. At that there is a decrease of temperature and increase of volume of the final gas mass. This increase of gas volume causes the increase of kinetic motion of the stream, which comes upwards, along the central axis of the device. This recharged stream with new energy arrives to the turbine disk, forces it to rotate with higher speed and to produce still more intensive vortex. This vortex creates still higher rarefication etc. Cooled damp air is thrown out by centrifugal force in the tube of the heat exchanger. Ideally, temperature of the heat exchanger is about absolute zero. The heat exchanger is placed in the environment, which is "medium of energy excess", though from the ordinary point of view it is normal. The heat exchanger is heated by it. Heat energy penetrates into the device and as a result transfers into energy of rotation of the "self-eversible toroid". We can make an interesting conclusion that there is also the oscillation process! And oscillations have a resonance, that is the increase of amplitude at minimal energy supply' Thus we will be able to stabilize the effect since there are evaluated the dependences between amplitude of oscillation and all influencing parameters. There is a temperature resonance! In my opinion, Schauberger was a great person and his name is undeservedly forgotten. I think he had nevertheless succeeded in making a generator, which gets energy from "nothing", more precisely, from environment. Even if it is made very ineffectively, since this energy is free, it can remove all against arguments. I believe that there is a possibility to make such engine-generator of amazing abilities, which can generate, or more precisely, concentrate energy from environment energy. Social and economic consequences of such invention are undoubtedly boundless. That is both a solution of energetic problems and change of the understanding of the notion "transport". From the foregoing, we can depict a certain design. Let's make the following device as a hypothetical, "virtual" engine ( Fig. B). 1. Generator of energy, i.e. a concentrator of environment energy. 2. 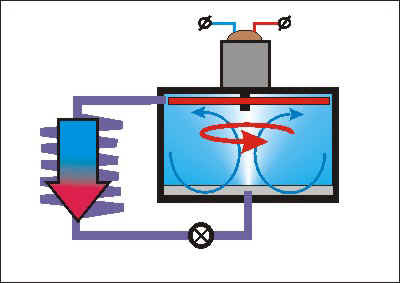 Heat engine, which has abilities to cool and condition. Besides, not necessarily to use water-air as actuating fluid, since air and freon are also possible. 3.1. There is a well-known effect of weight loss of fast-rotating masses. What does it depend on? Let us return to Fig. 12. It is clear that at such a rotation of air there is a possibility to run up J-»sq s to unconceivable speeds (due to small air mass). The device is not threatened with destroy, for example, as distinct from a metal flywheel. In spite of complexity of the trajectory, each point of it moves at a tangent to the Earth surface. It is quite possible to reach 8 km/sec linear speed on this trajectory. If an artificial satellite with 1m orbit can exist, then there is a question: "Is levitation possible here?" 3.2. Some time ago an article on gravitational mechanisms (mertioids) was published in "Technica Molodyozi" ("Technics for Young People"). There was a description of about 10 types of mechanism as well as the explanation why they could not fly. However, in the end of the article it is stated that there is no final verdict on the work of such devices, and the issue remains open. Thus I offer #11. Let us concern the experiment I made, i.e. the rotation of the usual flywheel, which was placed on the axis of electromotor. I hold the motor with my hands. The capacity of the motor was about 70 Wtt at 7000 r/min and U=24V. The rotating flywheel (aluminum disk of 10cm diameter and about 200 gram weight) looks like an mertioid! It is enough to rotate the device around your arm to feel incomprehensible propulsion, which is definitely directed. This interesting effect is obtained due to the simultaneous rotation around 2 axes (axis of the motor and axis of the arm). The results of the experiment caused the appearance of the idea, which has much in common with Schauberger's device. Thus we can formulate some general principles of operation of the devices, which generate mechanical energy at "absorption" of energy from environment. 1. There is a generation of the process, which is close to be self-sustaining (We can find such examples in hydraulics. The vortex of the type of Einstein's glass is very unstable and rather inertial state. There are many examples in nature, such as: swirl of water or air, natural tornado; in electrotechnics, such as: electromotor and dynamo, which are connected on the same axis, etc). For real self-support it is necessary to add external energy in such a system. Sometimes energy, which , compensates losses by friction or resistance, can be enough. 2. There is amplification of the process right up to resonance, which takes place in such a device (in vortex there is a process of heating-cooling of air-water compound and in electrotechnics there is the induction of electromagnetic fields). 3. The device is "reversed" with respect to the environment in such a way, that some part of the device will have energy with very decreased energy potential. This "reversing" will become an absorber of environment energy. For example, in hydraulics the central part of Shauberger's device is a space, which is close to absolute zero by temperature and pressure. Therefore this part of the device is placed in the usual environment of excess energy potential. In electrotechnics it is more complicated, since there is a superposition and resonance of fields. 4. There is a release of "absorbed" energy from the closed space of the device in the form of mechanical or electric energy. This energy is absorbed from the outside. - Tesla's generator and Serl's generator in electrotechnics. Thus we can conceive the interior of Schauberger's Repulsme. Most likely, this device was similar to vortex engine-propulsion unit-generator of energy ( Fig. C). Vortex, which is created in the central part of the device, absorbs heat from air, which traverses through turbine blades by means of heat-exchanger. The heat-exchanger is actually a usual centrifugal pump. 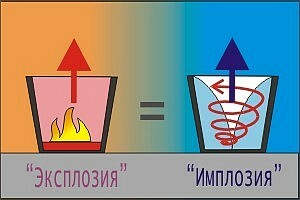 Vortex absorbs that minimal part of heat, which is necessary to keep rotation. The engine starts the operation at turbine untwisting and at slight water injection, which comes from below. Probably, after the mode of tornado is reached, there is no need in water and only air serves as actuating fluid. 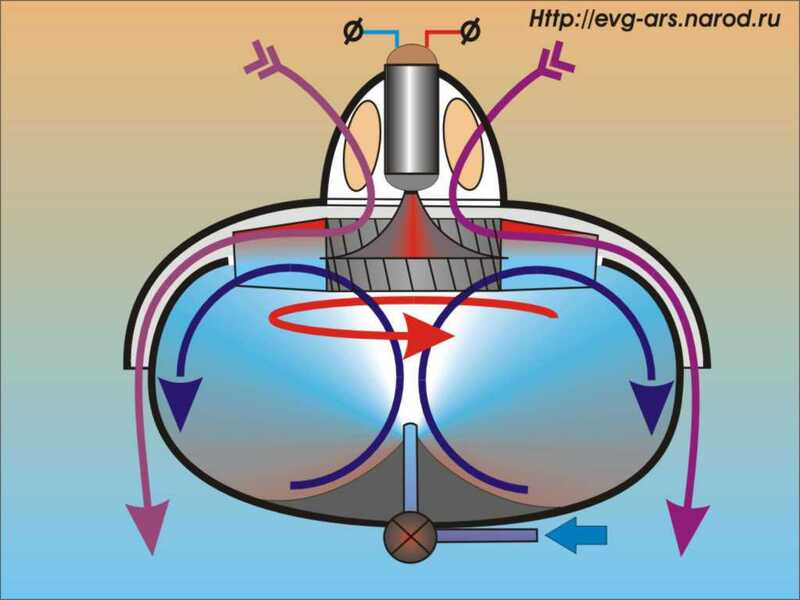 During operating of the engine, pressure is decreased in the center and increased at the periphery of it. Rank's effect works in full here. More precisely, its work is even more pronounced than in "Rank's tubes" (since in Rank's tubes swirled air is thrown outside instantly and rather uneconormcally, and in the given case there is "accumulation" of the effect at circular meridian rotation). The cooled from below heat-exchanger-turbine is heated from above by compressed air. The rejection of this cooled air causes usual reactive thrust. If it actually works (I think that if Schauberger's engine really existed, it had the similar design) then this design could be considered as absolutely universal engine- propulsion unit-generator of energy. It is super ecological and fuel-less, since it has cool airflow as exhaust. Technological effectiveness of the design is on the level of the beginning of past century. Simplicity of the design can make us doubt its capacity for work. But I believe there are no distinct contradictions here. The commercial plant, designed for generation of electric energy, could look in the following way ( Fig. D). The design is very simple. Why should the "vortex trunk" be directed downwards? Let us turn the design upside down. Thus, the generation of artificial vortex is greatly simplified. What is necessary to create the vortex? The answer is as follows, we need not much of environment heat, moisture and the initial swirl of mass of damp air. A cup-shaped vessel is filled with usual water. 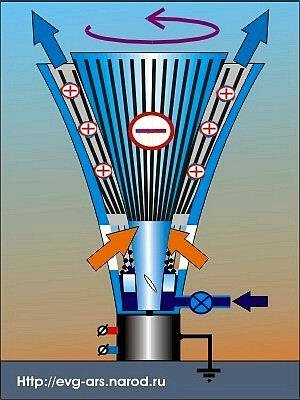 At the starting stage of operation, motor-generator starts to swirl a water-air cone by means of turbine with helical blades. When the device starts operating in tornado regime, then heat is absorbed from the ambient air. At that, motion of rarefied air accelerates along the center of vortex and this airflow starts pressing upon turbine blades. Motor-generator can be switched to the mode of energy-generation. There is a minimal description of the device operation, but really the processes are more complex (there is advisedly left out the description of mini-tornado, which is created at the appearance of the main tornado. The possible electrostatic effects are not described also). Figure D is an attempt to emphasize the main thing, i.e. the fact, that process of vortex self-supporting is possible and in my opinion, it is rather simple. I have no ideas about the height of the obtained vortex (at least if the scales are kept it will be much higher than in the Fig. D). But if the process of natural vortices creation is ordinary (at that, sometimes there are no obvious reasons for their appearance), then I offer to consider the proposed device as a set of details, which provide the artificial creation of the natural phenomenon. There is another question on the size of the device. I do not offer the giant size (50 meters in diameter Messiah mashine can be concerned as such negative example). The description of Schauberger's Home Machine Power seems to be more likely. Its diameter is about 1 meter. Besides, my own design is a symbiosis between thesetwo devices, however constructively it seems simpler and probably better. Its minimal size is still defined by laws of nature, since I have never seen natural air vortex, the size of which was less than I meter (usual swirls on dusty road are the simple example of such phenomenon). But at the same time, if we imagine the maximal size of such a system, then our imagination will easily picture a huge plant, which is placed on the open air and which is able to generate a real tornado with all its disruptive power. But this tornado is "tamed" and therefore it always stays at one and the same place, i.e. exactly over the energy plant. And what if we build a system of large-scaled vortex energy plants, which are able to cool environment? Then we can speak about the influence on climate' It would be an important contribution to the global warming control. Of course, everything looks rather fantastical, however I would like to intensify the impression and to understand at last the essence of Implosion and what Schauberger wanted to offer. Nowadays the whole man-caused civilization depends on Explosion (in translation from Latin it means "explosion", "exhaust"). Operation of any modern heat-engine (see the left part of Fig. 13) is fuel combustion of a certain extension, which causes raise of temperature and expansion of working body due to this burning. The expanded working body pushes a piston or turbine and then is thrown away to obtain reactive impulse. Practically, operation of any engine is based on the process of expansion, which is the result of fuel combustion, This causes squandering of nonrenewable natural resources, viz: gas, oil, coal, and uranium (the products of such a technology is a separate great problem). However the expansion of the working body can be obtained in result of absolutely different process! 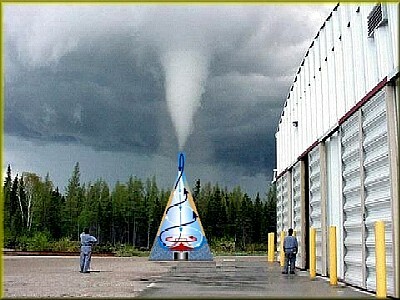 Natural tornado can serve as an example. 1. Due to the rarefication of the central part of the vortex by centrifugal forces, there is a definite volume expansion of final mass of gas and decrease of gas temperature. This mass is "supported" by walls and bottom of the vessel. The only way to expand is to move upwards. 2. In the central part of the vessel the rarefied part of gas behaves according to Archimedean principle (more lightweight body floats). It looks like a coverless balloon. 3. Swirling air obtains a considerable electric potential, which is positive in the center and negative at the periphery. In spite of its simplicity, this tornado model (as well as the very tornado) is an excellent electrostatic generator (the theory of appearance of such electric potential has the best representation in materials on Searl's generator). In natural tornado the millions Volt value is obtained that results in the constant appearance of lightnings in "tornado eye" and in its "trunk". Thus in the presence of such high voltage there is air electrization in the body of tornado. And as is well known, like charges repel each other! (Positively charged air molecules, which are devoid of electrons, repel each other). In such a way, due to electrostatic forces there is a rise of gas pressure! This expansion causes the additional impulse for the upward motion of air. Is there in physic a formulation of such an effect, i.e. the expansion of gas volume at its electrization? If there is no, then it seems to be a discovery! Figure 14 is an attempt to prove, that tornado is electrostatic machine, and at that it has the simplest design. The sectional view of tornado (see Fig. 14) represents an attempt to synthesize the designs, which are offered by different inventors (in such devices a simple cylinder serves as rotor. This cylinder is made of dielectric and on each side of it there is high voltage in several tens of KV). There is also an attempt to answer the question: what are the means for tornado swirling? The researchers of natural tornados speak about the presence of the system of mini-tornados at inner wallsof the mam tornado (here I return to the balls-rolls,which were concerned above). There is also high electric potential, which is generated on this inner wall with respect to the center of swirling. In my opinion, these balls-rolls are under high electric potential and serve as rotors of the peculiar electric engine. That is an immediate source of tornado swirling! There is a usual process of electrization at friction of dielectrics (see the animation on http://evg-ars narod). At some boundary voltage there is "switching off" the forces of electrostatic attraction, which compressed the balls. As a result of that, balls increase in their diameter. Pressure release, which exists in the balls, should cause their cooling. This process is constant along the whole height of the tornado trunk. There is an interesting effect to be noted, the higher speed of tornado, the thinner its trunk. But these are electrostatic forces that can explain everything ! The higher speed of swirling, the more potential difference of the center and periphery is, the more intensive attraction of the charged particles, and the thinner trunk of tornado! Tornado has the ideal conditions for electrization, since there are huge friction dielectric surfaces (nobody knows why there is a transmission of electrons at friction of wool on amber, but it does not mean we cannot use that). 4. All devices have not less than 1 meter proportions (since the operation of all these devices is based on the presence of a vortex-tornado. 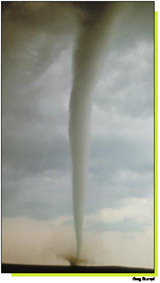 Appearance of this tornado is caused by physical properties of water and air, which are heat capacity, heat conduction, breakdown voltage, sluggishness etc).Let me summarize the principles of operation of all these devices and offer my own design, which include the most useful of them ( Fig.E). The device generates local natural tornado. 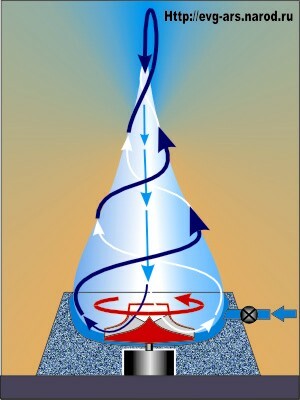 There is an attempt to elaborate the principles, which are in the basis of the electrostatic model of tornado (see Fig. 14). In its principle of operation the device has very much in common with well known from school electrostatic generator (do you remember 2 rotating in opposite directions plexiglass disks covered with foil and a lightning, appearing at breakdown between two metal balls, which take the potential form these discs?). In our case the whole device is rolled up in a cone. Rotating inner rotor, which is made of maximum possible lightweight material (e.g. thin-walled plastic), creates spiral and swirling on their axes air bunches. These very air bunches are charge suppliers (they are not presented at Fig.E). The device operates in the following way: the plates are positively charged on rotor and negatively on stator (metallized black straps can be applied on the cone of rotor-stator by galvanoplastics method). Engine-generator works as a motor until the plates reach breakdown voltage. Then there appears a charge between pairs of rotor-stator plates that causes appearance of impulses, promoting acceleration of rotation. Inflow of "fresh" air from below provides self-sustaining of rotation. Motor-generator turns to the oscillating mode. Water, is pumped from below and promotes intensification of air electrization (there is an effect of intensive electrization at splashing of water drops in air, e.g. waterfall streams). It is well known that tornado is strongly "attracted" by ponds. That is the principle of operation in general. The only energy sources are water and a huge amount of air, transmitted through the device. Lightweight thin-walled plastic with galvanoplastic metallization can be used as a material for rotor-stator (the usage of glued foil is also possible). The device must have not less than 1 meter diameter, since it is very important for the successful operation (there was a failure of Roshchm-Godin's experiment with the device, which had 20 cm. diameter, whereas the device with 1 meter diameter worked). Do not forget to ground metal parts of motor-generator! Here is the project of the generator. There are no elaborated design drawings and everything should be tested. However, if it is able to operate, then the similar commercial plant can be easily produced, especially since the simpler device, the more effective it is. At this stage the author focused attention on generation of energy, while creation of aircraft is the further step in development of the project. Most likely, in Schauberger's engine "supply" air proceeds from below and from above (i.e. there is a vortex chamber on top of the device just as it is). Two mirror vortices have common "tornado eye". During operation there is constant electrization of the flow inside the device. Negatively charged ring is created in the center of toroidal space (according to the suggested electrostatic theory of tornado). In principle, framework of the device can acquire positive potential. However to make sure, it is better to ground the framework. At electric breakdown of water-air compound there is cooling and twisting of tornado cords inside the device. That is a motive force of the device. Air ioni2ation is possible around the framework (in the absence of grounding). 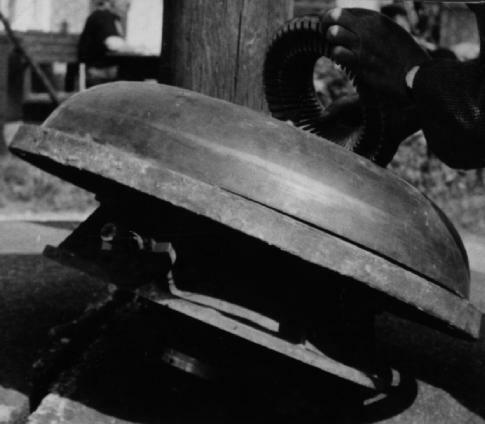 At the first stage it is offered to use classic Schauberger's turbine as turbine of the device (corkscrews allow to obtain required twisting of water and air flows inside the device). It is also possible to use a usual doubled centrifugal turbine. The device can be made of metal (as Shauberger's one) or of dielectric (for example, plastic) that is more interesting from the modern point of view. Diameter of the whole device is about 1 meter. Water-air cords, which are generated by the corkscrews (or by blades in the second case) have 3-5 cm diameter. There are many publications on Koand effect, which appears during the operation of Schauberger's engine. For some reason in these works Koand effect is always described as an explanation of wing lift. But Koand effect is a phenomenon of absolutely another kind! It is the adherence of gas or fluid flow to the surface along which they move! Obviously, the problem is m the erroneous understanding of Shauberger's notes about the presence of such effect during the operation of the device. In my opinion, using Koand effect we can make a rotor wheel, which has no blades or corkscrews. This rotor wheel can have the form of doubled hyperbolic cone. At hyper-high speeds of rotation of such a turbine, water-air compound will be involved in tornado swirling exactly by means of Koand effect, i.e. by means of adhesion of particles to the surface of the rotating cone. (See cover page, Fig. H). By its design this turbine is very simple, since only maximal lightness and durability are demanded, Plastic seems to be the best material, hence the design represents a rotor-thin-walled plastic "whirligig". All electrostatic effects and other principles of operation are valid here (See Fig.H). Let us now move away from Schauberger's principles and formulate the following problem- to achieve stability of the process by modernization of the device, i.e. by removing of all mechanically movable parts. Can you imagine fireworks, which are the rotating wheels with burning rockets on the rims? These rims gradually accelerate and turn into the burning ring. It looks very effectively but absolutely useless, at first sight. Speed of rotation is very high but nevertheless it is definite. What is the limit for this speed of rotation? Have you ever thought why usual electro-motor is no table to rotate with the speed, •which is higher than some maximal one, and no matter how long you will apply voltage to the device? Everything is limited by moment of inertia, existing for gyrating masses. This moment of inertia is denned by the weight of rotating body and by weight distribution on the axis of rotation. Therefore massive rotor of electric motor or of rotating turbine can never be rotated up to super speeds. Nowadays aircraft turbines have the highest speed of rotation (about 150 thousand rot/mm). Why should we need to rotate a heavy turbine or rotor? What if we will rotate air or, more precisely, combustion products? Roughly speaking, I offer to stop rotation of the firework wheel and force rotation of air or combustion products along some inner rim. Therefore we will obtain a burning ring, which will get required reactive force at rejection of incandescent gases in proper direction. Let us consider the problem from this point. Operation of rocket engine is based on the expansion reaction, which takes place in some closed space (at combustion of fuel + oxidant in the chamber) and also the emission of combustion products in the same direction. At that, a body moves in the opposite direction. Let us fill a cup with fuel and burn it (see Fig.15). Fuel expands at combustion and as a result of natural convection the combustion products go up. In the real rocket engine there is a forced injection of fuel and oxidant into the cup that causes more intensive motion of combustion products, than in our case. Let us modernize the cup and make a hole in its center (see Fig. 16). Thus, portions of air can inflow from below and sustain combustion. Expanding consumption products repel themselves from inclined walls of the combustion chamber and therefore their raise is more justified. Let us place several similar chambers one after another (Fig. 17). If we concern each chamber individually, then combustion products at their expansion repel themselves from inclined walls of the chamber and obtain some impulse. At that, the process appears in the lower chamber and then becomes more intensive in the second and all subsequent chambers. Thus combustion products are gradually accelerated. There is a process of kinetic energy storage. In order to make the process of storage to be continuous, we should coil everything up. Let us examine operation of the following device, which can be made of a metal tin (see Fig. 18). The arrows symbolize burning fuel, which obtains an impulse at the expansion. This diagram is not connected with attraction as the presented above figures of cups. It is caused by the fact that centrifugal forces come into force, i.e. fuel is pressed to the rim and portions of air are delivered by centrifugal force through the hole in the center of the device (see the top view on Fig. 18). In the center there can be placed a motor-generator to release energy (see Schauberger's device). The presented design has 4 combustion chambers and most likely, the vortex will be swirled of 4 rotating cylinders. Shauberger's device has 24 cylinders at 1-meter diameter of the construction. Such proportions can be justified in physical sense. In the same way we can take the required number of chambers. Then the vortex is contracted to point as in the aforesaid description of balls-rolls. The operation of the device is presented in Fig. 19 (view from within). There is a toroid, which has self-support of combustion reaction. The toroid draws air by means of centrifugal force and throws up combustion products. Speed of rotation of the toroid can be very high since its small mass. At the same time, at superhigh speed of rotation of this tore, some new and still unknown phenomena can become apparent. If this engine really works, then there is no necessity of production accuracy and of high technologies, which are required for making of aircraft turbines and rocket engines. The only essential requirement is heat resistance of the device. Such an engine could be made at the appearance of ceramic stuff, i.e. far earlier than modern era. Now there is another "technological nonsense". I offer to make the simplest air-reactive engine, which has no movable parts. Certainly, many readers have used to observe benzine or another inflammable substance burning in a metal bucket or barrel. From time to time, tongues of flame create rising swirled vortex, which disappears at once, since there are no special reasons for its existence. What if we help the flame and spend for rotation all energy, which is generated in result of expansion of combustion products? Progressive motion will be the consequence of this process. The device (see Fig. 20) represents a bucket with legs and a hole in its lower part. To support the reaction, air inflows from below. The plate-made, corona-like part of the device coils up combustion products. Then under the influence of centrifugal forces combustion products go up along walls of the bucket. New portions of air aredrawn in the device from below and at once react with each other (the more intensive combustion, the more portions of air are drawn into swirling that in its turn promotes combustion). The only aim is to forward all energy output to swirling. This device is a miniature model of typhoon-tornado-spout, i.e. a naive attempt to reproduce a natural phenomenon in a simple leaky bucket. But there is still undecided question: what is the reason for limitation of speed of swirling and therefore speed of the flow, which goes from below? Let me say several words about fuel for the device. It is evident that at the initial stage of operation the device has lack of air. Therefore, fuel should have oxidant in its compound (something like napalm, which can burn by itself). But, quite possible, I am wrong and usual aviation spirit is enough. Later on I will try to develop this idea and modernize the design. The main point will be the same, i.e. how to make engine, which has no movable parts. There are so many new ideas on the variants of engines that I am hardly able to describe them, not to mention about making. If you will decide to make something similar, please, write (mailto:evg-ars@mail.ru) but let me get notice that everything is submitted in Internet without diagrams and calculations. What do you think about? Best regurds for all from Evgeny ArSEntyEV.